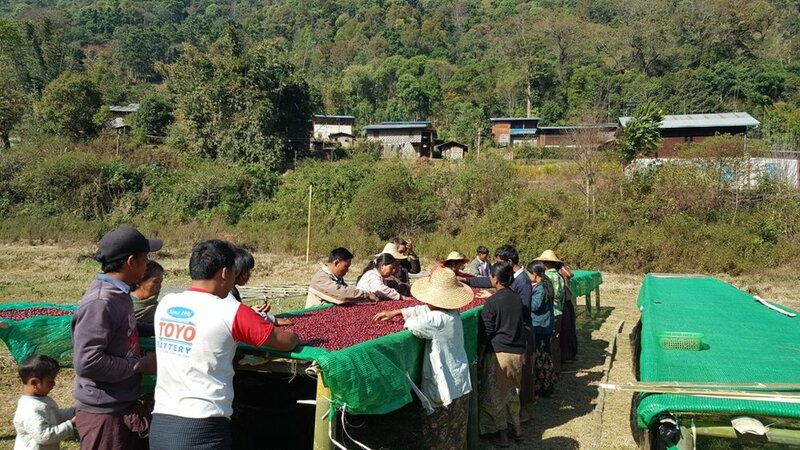 Myanmar has only recently been creating specialty coffees but is doing so with impressive speed and results. 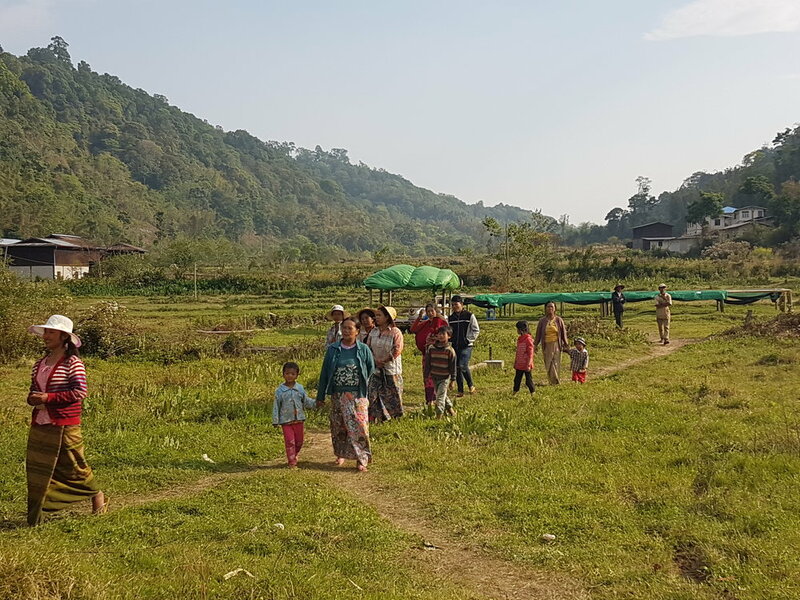 Our partner coop Hopong was able to organise coffee farmers from two villages in just one year and collectively process their very first batch of sun dried natural coffee - and even find an export outlet in the same season thanks to Sara Morrocchi. Fed up with secretly producing opium for druglords while being prosecuted by authorities on the one hand, and selling poorly processed coffee to brokers and middlemen on the other, the Hopong farmers took a major leap of faith and fully embraced specialty coffee to become truly independent. Incredibly, they learned through social media that neighbouring communities were producing specialty sundried natural coffee with help from Winrock, an NGO. With loads of commitment and inquisitiveness, they managed to learn from these other communities how to elevate quality, secure better incomes and gain visibility in the international specialty coffee market - all with hardly any outside funding or training. After all this, they were able to create a first pilot batch of only three bags in 2017 that we spread thinly spreading throughout Europe. This season, there’s much more to go round, we were able to support all the farmers of the villages of Long Hay and Bant Sauk by buying their full harvest. Expect passion fruit and pineapple next to the already famous banana sweetness. Since all Hopong's coffee is dry processed, there is no wet mill in this value chain. Our partner Mandalay Coffee Group take care of the drying and export process while the farmers themselves organise all farming, picking and drying procedures and upgrades. Using specialty coffee as a means to counter illicit opium production, managed to create specialty naturals in just one year, TSU buys the entire harvest of Hopong’s principal villages. 2017: built a sun dried natural coffee station and sold their very first specialty lot in the international market. 2018: Met MCG and the coop leaders in Amsterdam for the Producer Crossover. Upped our import from 3 to 50 bags, the entire harvest of Long Hay and surrounding villages. Every kilo with a premium of € 3,24. Sun dried natural process. Cherries are hand picked by Hopong community members in the early hours of the day. Once collection is finished, members delivers cherries to Hopong drying stations. On delivery, cherries are screened and handpicked to about 95% cherry ripeness level. Fully ripe cherries are then placed on raised beds. Slow drying is a priority and drying times range between 13-17 days depending on weather conditions. All lots are separated by day and all members’ deliveries are fully traceable. the price you pay for this coffee p/kg. We paid Mandalay Coffee Group USD 4 p/lb FOB Yangon for the Long Hay Village lot. 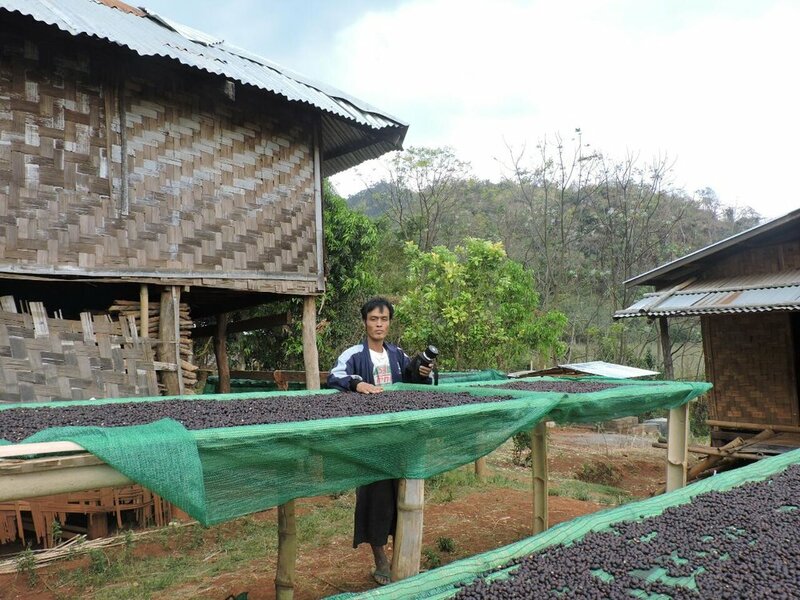 the price Mandalay Coffee Group pays Hopong farmers for their dried cherries as p/kg price of green (milled) coffee. The extra € 3,24 is a premium we paid the Hopong community members to reward the quality they produce and to support them for the next harvest. Mandalay Coffee Group costs incurred: milling and packaging + local logistics + export logistics + local taxes respectively. international shipping + clearance costs in Rotterdam, Netherlands. This Side Up compensation for spending time and resources importing this coffee. Our work includes building relationships with shipping and warehousing partners, managing export, import and shipping bureaucracy, Q grading, sampling and jointly promoting this coffee with MCG and the Hopong farmers themselves. Like most naturals in the Ikawa, the Hopong needs a lot of heat immediately to allow it to develop smoothly. We like to use Sebastiaan Geistdorfer's steadily rising natural profile for this one as it gets the smoothest body, subtle ferment notes and especially the crazy fruits out of this coffee. You may use these images freely to promote Hopong coffee among your customers. Hopong's community members and their leaders do not speak adequate English. 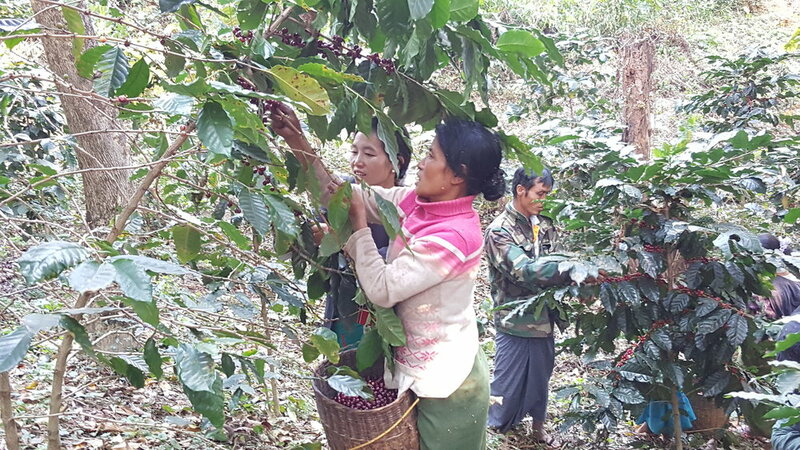 We recommend to get in touch with their export and milling representative Sai Wan at Mandalay Coffee Group instead if you want to learn more about or visit the Hopong cooperative. Hopong is a township located in Taunggy District in Southern Shan State. It is a part of a self-administered zone led by the Pa-O ethnic group. It has been growing coffee for many decades but production has been very unstable. Cherry price is very low and most farmers are not interested in coffee farming. Cheroot leaf –used to produce cigars – is another cash crop available in the area. But again, prices are not attractive to farmers. Since both coffee and cheroot leaf haven’t been profitable, most farmers focus on growing poppy – a flower whose sap is used to produce opium. Poppy production is not legal in Myanmar. For that reason, it exposes farmers to all sorts of dangers. Exploitation and manipulation from powerful and wealthy drug lords, on one hand. It also exposes farmers to becoming targets of government led expeditions to eradicate poppy farms. In many ways, farmers are caught in between power and money dynamics. The United Nations Office on Drugs and Crime (UNODC) launched a crop replacement program to support the poppy farms eradication. The UNODC coffee program was launched in 2014 in an effort to give farmers an alternative income to poppy growing. It is a relatively successful program focusing on establishing coffee farms and providing farmers with technical training to increase yield and productivity. Through UNODC program, Hopong communities planted roughly 2300 plants per household in 2014 and then again in 2015 – mainly Catuai variety. The coffee is mainly sold through Green Gold Farmer Cooperative – also established by UNODC. The cooperative as as a buyer, purchasing parchment from its members. It also buys under ripe and floaters at a discount rate. Though it is undeniable that Green Gold is a reliable market player, it mainly sells to the local coffee market. Premiums for farmers are low. Hopong communities learnt about specialty coffee almost by chance. Through social media, they learnt about a few neighbouring communities producing specialty sundried natural coffee. They heard of a USAID funded organization running technical and quality control training among these communities to improve the quality of cherries. Lastly, they learnt that international specialty coffee buyers were buying the coffee and that it would finally appear in coffee shops in US. Hopong leaders decided to contact the Winrock International (ngo running specialty coffee production in the area) to be involved in the project and help make the shift to specialty. Due to limited scope and funding, Winrock could not fully accommodate their request, but managed to arrange a 2 week peer-to-peer training. Leaders from Hopong stayed in one of the specialty coffee producing communities to learn the tricks of the trade. After the training, leaders went back to their communities and implemented everything they have learnt. Together, they were able to produce 6 bags of sundried natural coffee. Compared to washed coffee, they find the natural process easier to manage. They feel they use less natural resources (water), and can take time to select and sort cherries on the drying tables. They have high expectations that specialty production will become a true income generation activity for farmers in the area. They see it as a strong alternative to poppy production because of the high premiums. They also value the chance to make a name for themselves internationally through their hard labour and commitment to producing something unique. One farmer from Hopong Township started planting coffee once he was given the seedlings from UNODC. However, prices were discouraging so he continued to grow cheroot leaf and poppy to make ends meet. It is a good diversification strategy but it has its shortcomings. One on hand, cheroot has very high production costs while margin are relatively low. Poppy on the other hand, has very high profit margins but is an incredibly risky business. Once the poppy is harvested, it is hard to store the produce at home, for fear that gov’t officials may find it. Farmer prefers to hide the poppy produce somewhere away from the home and wait for the opportunity to sell it to brokers. When brokers are in town, meetings are arranged and transactions occur. When UNODC started its coffee program, farmer took part. Since then, he discontinued poppy production. After three years, his coffee trees have started to produce but the cherry price is still relatively low. 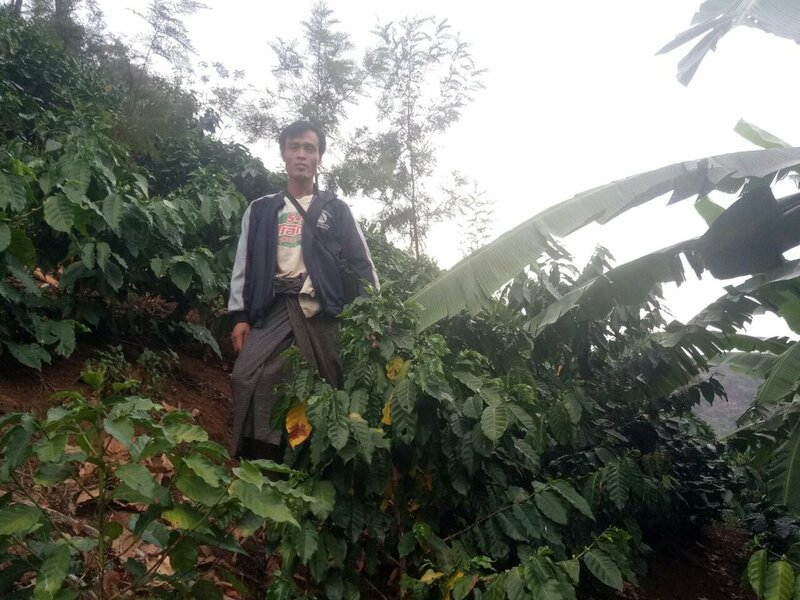 An interesting opportunity came along when he heard through social media of a group of coffee farmers making high profits with their coffee sales. He learnt that these farmers were producing specialty coffee and had clients coming all the way from United States to taste it. It was very interesting news and decided to try his luck with Winrock International – the ngo running the specialty coffee program in partnership with these farmers. He managed to visit one of the most successful specialty coffee production operations in the country – in a small village called Mya Ze Di. After spending some time over there, observing and learning, he decided to go back to his village and do some testing. He organised a small specialty production coffee unit together with other farmers. In total, they were able to produce three bags (green coffee). Not a lot, but enough to keep them engaged and wanting to scale production for next year. After thinly spreading the only 3,5 bags that were left for us last year throughout Europe, the Hopong cooperative and This Side Up got chummy - especially after the quality time spent at the World of Coffee where we made plans for long-lasting cooperation. With our premium of € 3,24 per kilo, they were comfortable to invest and expand to a total of more than 40 bags of naturals this season - so there’s much more to go round in 2018. This year’s main import comes from the village of Long Hay and surrounding smaller settlements, while the other lot, Bant Sauk was much smaller. We're incredibly excited to see so much support and interest for Hopong throughout Europe and do our best to engage roasters fully into these heroes' worlds this season.